Happy birthday Regan Miller Jones!! Regan is an inspiring woman, mother and dietitian. She has taken blogging, food photography and social media to a whole new level (Healthy Aperture, RDs4Disclosure, Recipe Redux, and Blog Brûlée to name a few of her accomplishments) and blazed the trail for so many of us trying to follow in her footsteps. In honor of her big 4-0, some fellow bloggers (led by the awesome Gretchen Brown of kumquat) thought we’d throw a virtual birthday party for her, either with a toast via a yummy cocktail recipe or a gluten-free treat. To be honest, I tried to go the gluten-free treat route, first using Regan’s amazing White Bean Blondies as a base. But it was a TOTAL flop! (her original recipe is incredible and I love it – flop totally my fault). So not having the time to really do some investigative work or more kitchen experimenting, I decided to go the cocktail route. Truthfully, I’m not much of a cocktail person. I’d much rather have a great glass of wine any day. 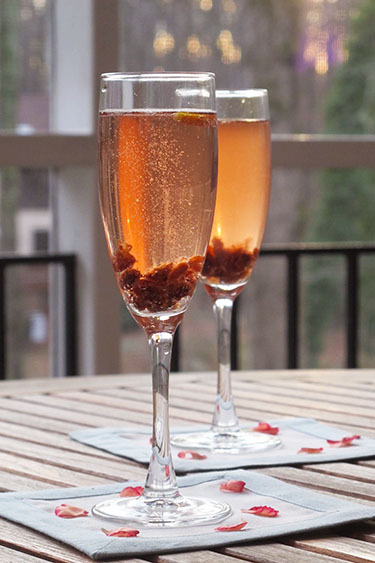 A few years ago, however, my husband and I had a staycation for a night down in Atlanta and I had an incredible sparkling wine cocktail made with rose water that I loved. I decided to create my own version here in honor of the birthday girl. It is perfectly refreshing with a hint of rose and orange. I like throwing in fruit to my cocktails and decided some tart Montmorency cherries were the perfect addition, a wonderful combination of sweet and tart. Rose water may be found in grocery stores like Whole Foods or high end liquor stores, but use sparingly as a little goes a very long way! Cheers, Regan, and a very happy birthday! 40 has actually been pretty good to me and I’m sure it will be to you as well! I wish for you for the coming year to be even more fruitful than the last with plenty of time for friends and family. I can’t wait to see what amazing things you have in store for the coming year! This is a refreshing sparkling wine cocktail. I prefer a Brut Rosé for the pretty pink color and flavor, though any sparkling wine will do. For a sweeter cocktail, add some simple syrup. If the tart Montmorency cherries are hard to find, then use dried cranberries or fresh strawberries or raspberries. 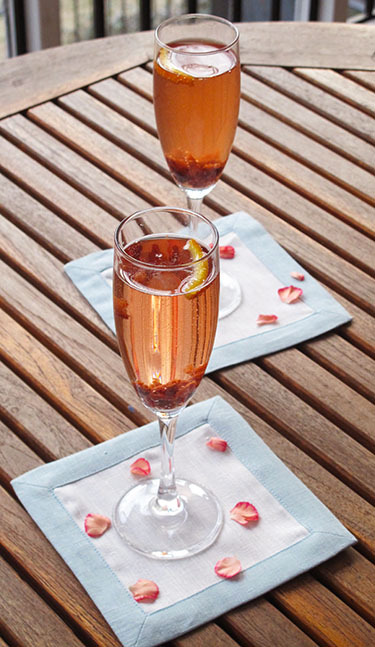 In a champagne glass, add the diced cherries then pour in the rose water, Grand Marnier and simple syrup if using. Slowly pour in the sparkling wine, being careful not to overflow the glass. The dried fruit will make it bubble more than usual. Top with an orange peel twist. Enjoy!